Whilst browsing through old copies of the RECORD, I re−read this article on page 85 of RECORD 5/6. Doubt was expressed that any Wrens remained in service, even in remote parts overseas. Readers may be interested to hear that in April 1970 a Wren was still at work in Thailand. The locomotive, Kerr Stuart 2387 of 1915, worked at the sawmill of the Srimaharacha Timber Company, between the sawmill and the jetty. The company, at Sri Racha, 115km south east of Bangkok and on the coast, formerly operated a 75cm gauge line for log haulage, some 58km in length. Locomotive stock included two Orenstein & Koppel 0−6−0 tender engines, numbers 6 and 7; and two Hudswell Clarke 0−4−2 saddle tanks 8 and 9, works numbers 900 of 1909 and 367 of 1890 respectively. All these were used for main line work. In the forest four Henschel 0−6−0 tanks (12, 14, 15 and 16) were used. The yard contained a derelict 0−6−0 saddle tank (thought to be number 3), a derelict 0−6−0 and two derelict diesels. The line closed about 1970 but the stretch from the mill to the pier was to be kept and worked by the Kerr Stuart. The above information has been gleaned from the "Continental Railway Journal" for June 1972. This journal can be recommended to IRS members having overseas interests for although mostly concerned with main line items, it gives quite a lot of space to minor railways and industrial locomotives in odd corners of the world. I was interested to see the reference on page 161 of RECORD 40 to the Orenstein & Koppel Mallets with the rear cylinders located under the driver's cab, also the illustration of such a machine. I enclose a commercial card from my collection showing MAGNET No.3 at work on the Waratah-Magnet tramway in Tasmania. (The message on the postcard was written on 30th January 1911 and the Mallet is identified as "the engine that takes you to Magnet.") The Magnet tramway was a 2ft gauge line built to transport gossan and sulphide ores from tin mines at Mount Magnet to Magnet Junction, some ten miles distant. Surveyed and built between January 1901 and January 1902, it was laid with 30lb rail and connected about 1½ miles east of Waratah with the Guilford-Waratah branch (closed 1939) of the 3ft 6in gauge Emu Bay Railway, which had begun life as the 45 mile long horse worked Burnie-Waratah line of the Van Diemen's Land Co. The latter operated in this manner between 1877 and 1881, and was then rebuilt as a steam traction line in 1884. Two Mini Mallets and an 0−4−0 tank (all by Orenstein & Koppel) were supplied through Central Mining & Tramway Appliances Proprietary Ltd for use on the Magnet tramway. Arriving in 1901, the 0−4−0 tank became No.2 and was used on construction work initially: later it saw use at the tin mines. Mallet No.1 arrived in October 1901 and was put into service by the beginning of November, following assembly. Its main dimensions were:- front (low pressure) cylinders 12in by 12in; rear (high pressure) cylinders 8in by 12in; wheel diameter 2ft 1in; rigid wheelbase 4ft 3in; total wheelbase 10ft; boiler pressure 170lb per sq in; weight in working order 18 tons. 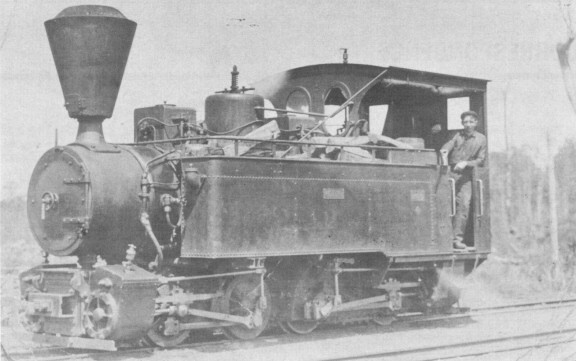 A second similar locomotive, No.3, was purchased some time between 1903 and 1905. After the line closed the two Mallets went to mining tramways in Western Australia, where one of them - probably No.3 or a combination of the two - still exists awaiting future preservation. The reason for the rear cylinders was presumably because there were no turning facilities on the lines where these locomotives were used and they therefore had to work equally well in either direction. Garratts and double Fairlies have cylinders similarly placed, no doubt for the same reason. Indeed, there seems to be a difference of opinion between Kenya and Tanganyika about the correct direction to work a Garratt! (See "Transactions of the Newcomen Society", Vol XL, 1967−68.) The North East Dundas Tramway, for which the first Garratt was built, was of course another 2ft gauge line much like the Magnet tramway, but I have been able to find out little about it. It may have had an earlier articulated locomotive, for according to C.C. Singleton and David Burke in "Railways of Australia" (Angus & Robertson, Sydney, 1963) the Tasmanian Government - which owned the Dundas line - purchased in 1902 a 2ft gauge J. Hagans Patent 2−6−4−0 tank. So far I have not been able to find out what sort of articulated locomotive this was. (Surely the main point about Orenstein & Koppel's adaptation of Anatole Mallet's idea is that it enabled a much larger grate area to be provided on a small gauge. The general Mallet principle, of course, involved the rear set of wheels and high pressure cylinders being set in the normal manner within the main frame, carrying boiler and superstructure and being an integral part of the locomotive. The front set of wheels and low pressure cylinders were contained in an articulated power bogie under the front end of the engine. (Reference to the photograph at the bottom of page 313 of RECORD 45 will help to illustrate this). However, by placing the high pressure cylinders at the extreme rear, the front wheels can be taken as far forward as the power bogie, thus increasing the rear wheelbase and enabling the fitting of a longer firebox and ashpan. Similarly outside main frames (not normally a Mallet feature) allowed a wider firebox and ashpan. Apart from longer steam pipes both to and from the high pressure cylinders under the cab there would appear to be no disadvantage over the usual Mallet design. In the latter a larger grate area could only be obtained by pitching the boiler higher, allowing the ashpan to sit over the frames; this would probably be quite acceptable on wider gauges. Perhaps Orenstein & Koppel's design was specifically developed to obtain a lower centre of gravity on 2ft gauge? Lionel Wiener, in his book "Articulated Locomotives", does not record this Drewitz variation. A further example still existed in April 1963 on the Pithiviers - Toury line in France; Orenstein & Koppel 1772 of 1905 (TPT 22.7). l am unaware of its previous history but understand it was cut up shortly after our visit. The TPT at that time possessed a veritable feast of articulated locomotives. After reading the editorial footnote on pages 171 and 172 of RECORD 40, I turned up my notes of an interview I had with a Pearson's gaffer in 1958. He had worked on the Dover Harbour contract for the Admiralty, completed about 1910, and remembered several locomotives, including one named JOE - a 'small tip loco' which he said later went to Port Talbot. With this third independent observation it is clear that there was a four wheel loco named JOE at Dover. Details of the Martin Mill line mentioned on page 355 of RECORD 34 may be found in the "Railway Magazine" for 1947 (pages 386-388) and 1968 (page 126). Peckett 781 and 782 (see page 170 of RECORD 40) were delivered to G. Thomas & Co, railway contractors of Manchester working in Sweden, their 7 and 8 respectively. 7 was rebuilt by Nydqvist & Holm AB and passed to the Malmö-Ystad Railway (their number 28), being eventually scrapped about 1941. 1 have no details at all concerning the disposal of Thomas number 8. Can anyone provide further information concerning Bagnall 614 of 1885 which became 2 on the Laxå-Rofors Railway in 1908? Society records show it going to "Dorman Brown Co." Named IDDESLEIGH, it was a standard gauge 0−4−0 saddle tank with 12in by 18in cylinders. (David Cole also suggests that two other Pecketts went to G. Thomas & Co in Sweden: 750 of 1898 (class B1), and 780 of 1899, the latter being quoted as G. Thomas & Co 6. Our Hon Records Officer points out that 780 is a blank number in the Peckett list, and that G. Thomas & Co 6 is shown as works number 750. Rebuilt by Nydqvist & Holm AB, 6 passed to the Ystad-Eslöv Railway (their number 1) and was eventually scrapped in 1950 or 1955. The details previously recorded for 750 would seem to fit 782, about which nothing was previously known. Assuming this to be correct, 782 (G. Thomas & Co 8) was rebuilt by Nydqvist & Holm AB, became Ystad-Eslöv Railway 3 and was scrapped in 1949 or 1956. Jung 617, mentioned on page 232 of RECORD 42, is recorded in "Danish Industrial Locomotives" (Union Publications, 1961) as passing secondhand to Frederiksholm Tegl. o. Kalkvaerk, Blaustrod Teglvaerk. Their number 4, it operated on 82cm gauge and was disposed of about 1954. It is supposed to have been an 0−4−0 tank, but this seems to be incorrect. As yet I have not been able to identify Kalkbrennerei AG in Denmark. The reference in RECORD 42 (page 219) to the locomotives sold to Roumania as the first exports from Russia is not quite correct, as two were sold to Spain in the 1880's. In view of the small number of locomotives exported from Russia, the list of Russian builders is surprisingly long. A survey of Russian rolling stock builders in "The Railway Gazette" for 1913 (volume 19, page 460) listed the following firms as builders or potential builders of locomotives, together with dates of foundation. One or two companies had disappeared by the time the list was compiled. For example, Eastwick & Harrison had closed their Philadelphia (USA) factory in 1844 and transferred their business to St Petersburg, and at one time Cail (of Paris, France) had a Russian factory. Even in more recent times Russia has not been an important exporter, at least to countries on this side of the Iron Curtain. Communist economic policy has been to encourage specialisation, and most exports of locomotives have been from the East-European satellites. The late R.H. Inness told me that the Black Hawthorn displayed in the 1876 W.G. Bagnall catalogue (see RECORD 43, page 259) was one which worked at Harecastle Colliery. According to Society records, Bidder & Elliott of Harecastle Colliery, Staffs, had an 0−4−0 saddle tank supplied new in 1866 by Black Hawthorn (works number 20) which had 12in by 19in cylinders and 3ft 3in diameter wheels. The note in RECORD 44 (page 271) about the use of a GWR locomotive during the sinking of Abercarn Colliery is by no means unique. A similar instance occurred at the sinking of No.1 shaft at Dover Colliery, Kent, in 1899 where a South Eastern Railway locomotive was jacked up and geared 1:5 to a winding drum from the site of one of the driving wheels. The locomotive was probably installed in late 1896 and would have been virtually disused after November 1897 when the shaft was flooded and abandoned. 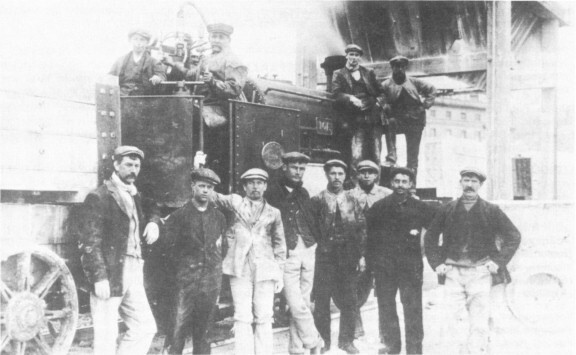 In August 1904, the locomotive "now decorates the scrap heap". Has this locomotive been identified? Referring to Mr. Roberts' letter on page 295 of RECORD 44, I can state that SNCV 443 was not British built but was one of three similar machines (SNCV 441−3) supplied by Haine St Pierre in 1905, works numbers 891−3. However, there were some British built machines on the SNCV, which had been supplied originally to the War Department (LROD) by Hawthorn Leslie and Robert Stephenson as follows:- LROD 201−30 (0−6−0 tram type), Robert Stephenson 3663−72 of 1916 and 3675−94 of 1917; LROD 231−50 (0−6−0 tram type), Hawthorn Leslie 3215−34 of 1917. All the Hawthorn Leslie batch and all but two of the Stephenson batch were eventually taken into SNCV stock, being numbered from 950-997 but not in any order of makers' numbers. Possibly they were numbered in the order of acquisition by the SNCV. During a visit to Belgium in 1950 I noted three of these locomotives at Louvain: 971 and 975 (Robert Stephenson 3669 and 3683 respectively) and 991 (Hawthorn Leslie 3223). I also noted 443 at Waremme and like Mr. Roberts I did not see any of the Alco batch. The Great Western locomotive referred to on page 271 of RECORD 44 would be the broad gauge 2−2−2 named HARPY, built by Fenton, Murray & Jackson in 1841, works number 29. According to page B56 of "The Locomotives of the Great Western Railway" (RCTS, 1952) it was sold by the GWR in August 1873 to the "Steam Coal Co., Abercarn". The engraving on page 289 of RECORD 44 is based on Bagnall 1681 of 1902, which was for Swan Village Gas Works. (See page 298 of RECORD 20.) This locomotive had 12in by 18in cylinders, whereas PHYLLIS (Bagnall 1453 of 1895) had 13½in by 20in cylinders. A works number was misprinted in my letter which appeared on page 329 of RECORD 45 and this makes my first comment meaningless. The second sentence should read "Elsewhere it is quoted as Beyer Peacock 2601 of 1885 (Mersey Railway No.1)."